Salomon Rondon is spearheading Newcastle's climb away from the relegation zone. Nick Wright examines his importance to Rafael Benitez's side ahead of their Monday Night Football clash away to Wolves. Salomon Rondon leans into his parked car, cranks up the music and starts dancing. It is snowing in the north-east but Newcastle's new hero is unperturbed. He wears shorts, flip-flops, and a broad smile. "Some hot salsa tunes to beat the cold!" reads the accompanying text. The video, posted on Twitter a few days after he inspired Newcastle's comeback win over Manchester City, went down predictably well with the club's fans. They have embraced the Venezuelan just as he has embraced his new surroundings. He has made himself at home both off the pitch and on it and Newcastle are feeling the benefits. Performances like the one against City show why Benitez was so determined to sign Rondon, but it was not immediately obvious that it was destined to work out. The 29-year-old struggled for form and fitness following his arrival on loan from West Brom in August, losing his place in the team after starts against Chelsea, Manchester City and Crystal Palace. It all changed when he scored both goals in a 2-1 win over Bournemouth in early November. Since then, there have been six goals and two assists in his last 12 appearances and he has started every Premier League game except the Boxing Day clash with Liverpool. It is perhaps no coincidence that Newcastle suffered their heaviest loss of the season in his absence. Rondon's overall tally of six goals in 19 Premier League appearances still looks relatively modest, but from that match-winning double against Bournemouth in November to his equaliser against City two weeks ago, every one of them has been vital. In fact, his goals have won his side nine points - putting him behind only Arsenal's Pierre-Emerick Aubameyang, Fulham's Aleksandar Mitrovic, Everton's Richarlison and Chelsea's Eden Hazard in the Premier League. The fact that Mitrovic has won his side more points than Rondon begs the question: would Newcastle have been better off sticking with the Serb? He is five years younger, after all, and has scored ten Premier League goals to Rondon's six. 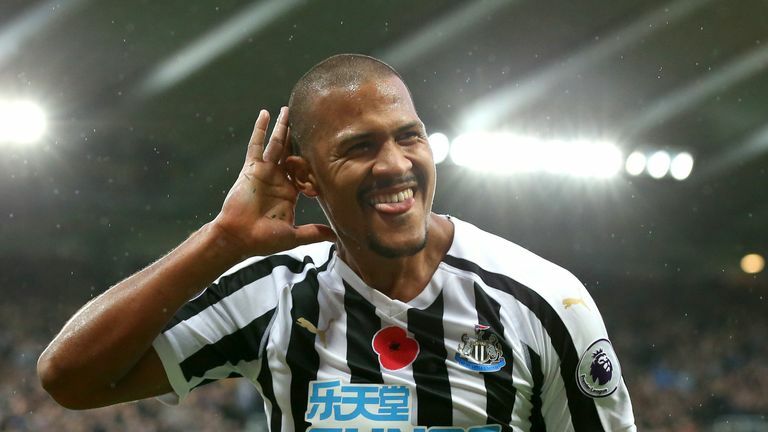 Benitez's willingness to sell him to Fulham to make room for Rondon provoked head-scratching in some quarters - not least in the Newcastle boardroom - but the Spaniard has made his thinking clear. It was not a down to a personality clash, he said, but to tactical factors. "We needed more mobility," Benitez explained in December. "Normally, if you are defending and play on the counter-attack, the striker has to have more mobility. If not, he's just a targetman. For our team, that is not ideal." Benitez felt that Mitrovic was unable - or perhaps unwilling - to produce the dynamism and work-rate he wanted from his striker and the tracking data backs him up. This season in the Premier League, the Serb has covered 9.8km per 90 minutes and averaged 6.2 sprints. Rondon, by contrast, has covered 10.7km per 90 minutes and averaged 9.9 sprints. Rondon gets through more defensive work, too, making 4.2 ball recoveries per 90 minutes to Mitrovic's 2.3. It is a considerable difference and it is another reason why Rondon is so popular on Tyneside. As well as holding the ball up, getting on the end of crosses and teeing up team-mates, he is always willing to chase down lost causes and defend from the front. Like the great Newcastle No 9s of the past, Rondon puts the team first. Benitez had to fight to convince the Newcastle hierarchy to sign Rondon on loan, so there are no guarantees that they will sanction a permanent deal at the end of the season. Rondon has said he would like to stay, thanking the fans for the way they have welcomed him, but according to Benitez, it is likely to depend on how many goals he scores between now and the end of the season. "Hopefully he can start scoring a lot of goals, and then you can ask me this in a few weeks and hopefully it can be positive then," he said recently. "I am happy with him, but still he can improve. I think he is doing a great job for the team, but we maybe have to support him a little bit more. If he has more support, if he has more crosses and passes into him, then he will score more goals because he can do it." The club-record signing of Miguel Almiron from Atlanta United should help in that regard. The Paraguay international arrives at St James' Park having scored 13 goals and provided 11 assists in the most recent MLS season. Only a handful of players created more scoring chances, according to Opta. "Almiron is going to be the man in between the midfield and Rondon," said tactics expert Danny Higginbotham on a recent episode of The Debate. "He will enable Rondon to not get isolated as much and play higher up the pitch. I think he's a great signing, he's a number 10, very quick, can play on the wings. He's got an outstanding left foot." The Monday Night Football meeting with Wolves could provide the first opportunity to see the new partnership in action. If all goes to plan for Newcastle and Benitez, there may be more Rondon dance moves to come.